This article by Munyaradzi Makoni on the work of the Integration Syndicate for Thomson Reuters Foundation, first appear on 4 May 2017. 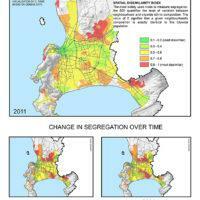 South African academics and activists have launched a project to tackle the “continuing apartheid” in Cape Town’s housing policies in a bid to reshape the coastal city and end racial segregation. The initiative comes amid growing protests over the impact of rapid gentrification in parts of the city which experts fear will further entrench the racial and economic divides that still characterise Cape Town more than 20 years after the end of apartheid. The Integration Syndicate – a partnership including three city universities, policymakers, and civil society groups – will hold monthly forums for experts and the public in an effort to revolutionise housing policies. When apartheid was introduced in 1948, it created separate development areas for different racial groups, formally expanding the colonial style of urban development established in the 18th century. Edgar Pieterse, who heads the Integration Syndicate, told the Thomson Reuters Foundation that these segregation policies contributed to the creation of market-driven patterns of investment that still shape the city today. Pieterse, who is director of the African Centre for Cities at the University of Cape Town, said social housing policies over the last quarter century had compounded the problem with low-cost housing being built further and further out on the periphery of townships and informal settlements where land is cheap. This has left poorer residents living far from transport hubs, services and jobs. The city of 3.74 million people – often named one of the world’s top tourist destinations for its spectacular beaches, scenery, shopping and dining – is the sixth most segregated area in South Africa, according to government data. The population is roughly 42 percent coloured, 37 percent black and 16 percent white. Most of the white population live in leafy neighbourhoods including ones along the coast, while the city’s poorest people – mostly black – are scattered throughout more than 200 dusty, cramped informal settlements far out of town. Around 1 million people – coloured and black – live in the large Cape Flats area southeast of the business district, which is often called “apartheid’s dumping ground” as it was home to people the apartheid government considered non-white. Experts say attempts to reverse the city’s planning legacy in recent years have failed and there is now an urgent need to re-think policy if proper integration is to be achieved. “(We need) a more radical approach which actively seeks to undo or respond to the legacy of spatial inequality,” said Kelly Arendse, of the Better Living Challenge which fosters innovations to improve the city’s informal settlements. She said it was time for a “concerted effort” to create an integrated city, and called for poorer communities long established in valuable inner areas such as the historic suburb of Woodstock to be protected. A new tax on vacant land to discourage idle land speculation and act as an incentive for integrated socially cohesive development was also needed, she said. The brainstorming initiative will culminate with a conference next year when the syndicate will present its findings. Cape Town’s urban segregation made headlines recently when demonstrations against the sale of publicly owned land highlighted the human impact of gentrification. In March, activists occupied two provincial government owned sites – the disused Woodstock Hospital and the Helen Bowden Nurses Home near the popular V&A Waterfront quarter – as they protested against the sale and redevelopment of inner city land which they argued should have been used for affordable housing. In Woodstock, an area undergoing gentrification, 27 families have spent more than a year fighting eviction requests from a developer which acquired their homes to build apartments for mid-to-upper-income tenants or buyers. Residents have turned down offers of alternative accommodation 30 minutes’ drive from the city saying it is too far out and are refusing to leave.